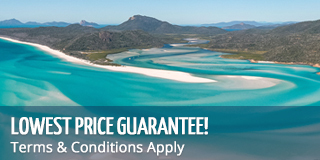 Take on the Whitsundays with speed on board a true racer! 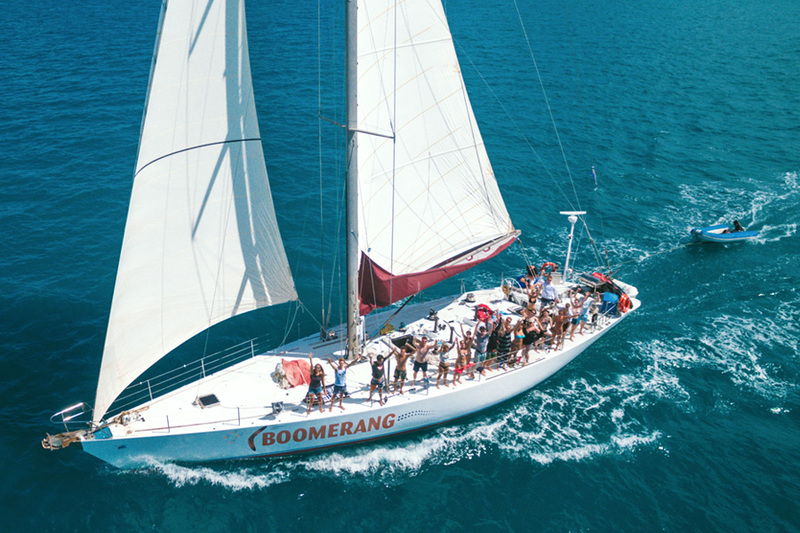 For 2 days and 2 nights, the crew of Boomerang will show you to all the hot spots of the Whitsundays. A true Maxi vessel, she boasts 83ft in length and 20ft wide - ample space to socialize during your tour. In her racing past, she has achieved great success, including placing 1st place in World Maxi Series Race, in addition to other wins in the USA, Japan and New Zealand. She has called the Whitsundays home since 2009 when she was refurbished to be a passenger vessel. Now housing 28 guests at a time, Boomerang offers a social tour that is great for backpackers and adventure-savvy travellers. Guests are welcome to help the crew sail, or to sit back and relax and enjoy the ride. Perfect for the young and young and young at heart, the average passengers ranges from 20 - 35 years old. Check out our video to see what the Boomerang has to offer! Young, fun and social demographic - very popular tour for 18-35's! If you want to get an insight into what true Maxi racing is all about and enjoy a good social time, book on to Boomerang today! Boomerang has an comfortable interior that features an open planned accommodation. Because the boat is so wide, there is plenty deck space to relax and soak up the sun! When she really get going, experience the thrill of your feet dangling off the side of the leaning vessel with the ocean breeze in your hair. Similar to famous racing ships, Boomerang offers bunk-style accommodation. Comfortable single and double bunks line the inside of the hulls, leaving lots of room for social space. Boomerang is suited for those who enjoy sleeping in a shared space, taking the opportunity to meet new people. 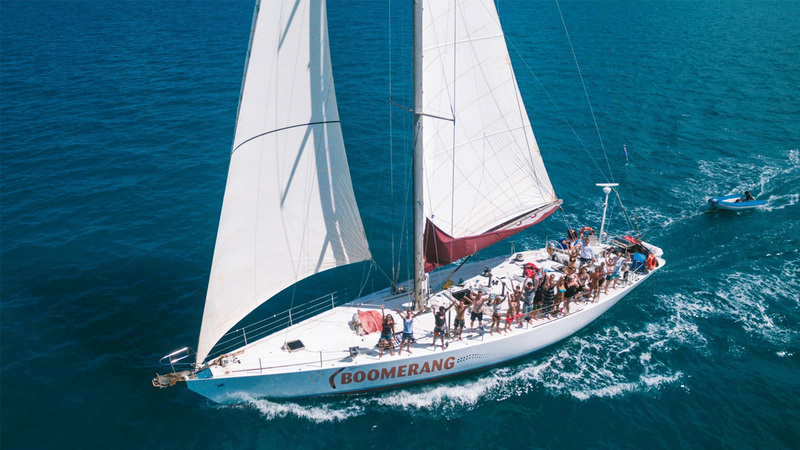 Boomerang's itinerary will have you sailing around many of the Whitsundays Islands during your 2 day and 2 night adventure. As a maxi yacht, Boomerang is a performance sailer which means you will be travelling around at speed all with the help of wind power. Guests are able to give the crew a hand and help set sail, raise a sheet and have a go at the captain's wheel to give them to full sailing experience! Whitsunday Island is home to the famous Whitehaven Beach and Hill Inlet lookout. Here you can get active and play some beach games with your new friends or simply sunbathe and relax on the white silica sand. Hill Inlet lookout is known as one of the best views in Australia, so be sure to snap some photos to show your family and friends back home. The best coral reefs typically exist around the Northern end of the Whitsundays Islands. Renowned sites which Boomerang usually visit are Langford Reef, Blue Pearl Bay and Mantaray Bay. The exact snorkel location depends on the sea conditions and your knowledgeable skipper will determine the best snorkelling location on the day. Either way, you will see an abundant range of corals and marine life. Boomerang is also available for Private Charter. BYO alcohol (no glass). Soft drinks available for purchase on board. All departures and itineraries are subject to weather. Tours may be changed or cancelled for any reason at the discretion of the Tour Operator. The Operator also reserves the right to alter the tour or the itinerary of any of it's tours and organise alternative carriers to those advertised if necessary. It should be noted that adventure travel involves risk. Whilst we make every effort to safeguard clients, we cannot be responsible for personal injury or loss due to actions of our clients which are beyond our control. We recommend that all clients have travel insurance covering illness, injury, loss or damage to personal belongings and not being able to travel on the confirmed date of departure. Please be aware operators pass on credit card merchant fees so there is a non-refundable 2.5% surcharge for VISA and MASTERCARD card purchases. All cancellations made result in 25% cancellation fee of the recommended retail price (RRP), not discounted or sale prices. All cancellations made 60-30 days prior to travel will result in a 50% cancellation fee of the total price and any cancellations made inside of 30 days to departure will result in forfeit of full trip fees. If the sailing company has to cancel the trip (prior to the boat's departure) and we cannot offer a suitable alternative, then a refund will be given minus card fees. We strongly recommend that you have travel insurance, especially during the wet season. "Fab trip around the Whitsundays with an awesome crew - spoilt rotten with the food now back to dominoes and pot noodles #backpacking"
"My best 2 days in Australia, out of 4 months of travel!!! Amazing views, great yacht, super nice crew!! Will definitely do it again one day, on board of Boomerang for sure." "Great trip great crew. Fun, food and lots of laughs. Highly recommend!!! Best boat trip ever!" "Great job, really enjoyed! Thank you!" "Really great fun. There was a perfect level of activities that made it relaxing and fun. The crew looked after us really well. Also, the most amazing food ever!" "It was an awesome adventure with an awesome crew!" "It was a really nice trip. I loved it, thank you!" "Great trip! Amazing place, fun sailing, diving and snorkelling!" "It was an awesome trip! We have had so much fun. Thanks for everything. Just keep going like this, too easy!" "Great trip - we only wish it had been longer! " "The crew was awesome and fun! Beautiful scenery and we saw some good snorkelling spots. The food was above expectation!" "Great staff, funny and welcoming. Interesting tour and activities. Everything was perfect!" "Great mix of people. It was all good fun, though the weather was bad." "Very good adventure! Seen a lot and had a very good time on the Boomerang. The crew is awesome. I will recommend this trip to others!" "Crew were friendly and knowledgeable. Generous food which was always tasty and lots of variety. Trip took us to some excellent snorkelling spots. Would recommend!" "Funny trip, amazing on the ocean! Its my first time to experience sailing! Its really cool! Thank you guys a lot! Make my trip so wonderful!" "Great trip, Thanks for a good time"
"I am very surprised because I have found out an amazing kindness, crew and excellent food. Everything was excellent and I hope come back." "A really nice tour, thank you so much for helping us explore this beautiful ocean. I loved snorkelling and scuba diving with you guys! Wonderful memories, thanks a lot!" "Excellent Trip, crew were amazing and good fun"
"Great Adventurers with an awesome team. Spots visited were amazing! " "Great experience. Good schedule. Nice snorkelling spot. " Definitely loved it. Will probably volunteer to be on a crew some day!" "Great Experience! snorkelling was awesome!" "The timing of the different stops is very good, the food also. Wed had really great weather. Thanks a lot for the great experience. " "It was a great trip! Especially the crew i'd strongly recommend a raise for everyone of these blokes." "Great experience! would highly recommend. Many many thanks x"
"Great time - crew was fantastic! Might want to create sound proof booth to house the snorers or pass out ear plugs or have those who snore sleep in the raft 1000miles from boat while reassuring them they are still good people :) Loved the food and ate like royalty"
"Awesome time, although the sleeping spaces deserve new mattress!" "Cool crew, smiling and happy. The places where we went were amazing and beautiful. The food was good. The team on the boat was very friendly! Would go again "
"Awesome trip with very friendly and entertaining crew, exciting experiences and a overall nice atmosphere"
"Good crew, good food, nice people, well relaxed. " "Great service by the crew. Had a great time w/ you guys!! Great food service. Will definitely recommend. ONLY drawback was broken toilet seat. Have a great summer & happy new year." "Great trip, friendly crew creates laid back atmosphere!" "Fun crew, friendly people, great vibes and views. 10/10 "
"Amazing trip - Amazing crew. Thank you guys! Would you travel again - YES"
"Great fun experience and great crew. Would be better if 2 whole days and 2 nights. Jack also needs bigger tears in his shorts!! Thanks Guys, loved it! "Great crew. Plenty of time @ Whitehaven :) Appreciated the mats to sleep on deck! " "Check in office experience 10/10 Quality of the adventure 10/10 Your crew 10/10 The quality of the food 10/10 Presentation of the Boat 10/10 I would do it again "
"Liam ran a great boat! Food was awesome"
"Crew were awesome. Relax environment. Great boat." "Was really good. Great food. Crew was helpful and nice. Enjoyable learning about sailing ad the environment of Whitsundays. " "Amazing!! Mels cooking is better than my mums!" "Really enjoyed it, crew were very friendly & relaxed." "Crew were excellent and made the trip a success from the start! Gunther is an excellent chef! 10 out of 10!!!" "Nice experience, good time, the teams fantastic with us. Never will I forget.. I think that I will come back soon!" "Fantastic crew, great food, good mix of organised events and time to do your own thing. 10 out of 10"
"Fantastic trip, wouldnt change a thing! " "Really good craic. Toast in the morning would have made my day - the crew was fantastic !" "Had an amazing time - beautiful scenery, boat was brilliant and the crew were really friendly and nice. Would definitely recommend to a friend." "10 out of 10. Great Experience on this boat, very nice crew and very nice people." "All crew on board are amazing, food was top notch. Everyone on board made this trip unreal. Whitsundays wouldn't be as awesome without the Boomerang crew!" "Fantastic Trip, Crew were amazing and kept everyone entertained"